Homemade Strawberry Jam tastes delicious, nothing on the grocery store shelf can compare. 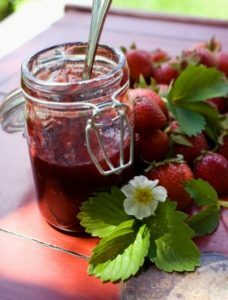 If you want the best tasting Strawberry Jam with no artificial additives or preservatives, you must learn how to make your own. 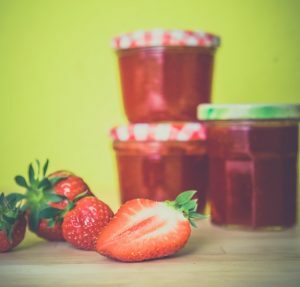 Despite rumors to the contrary, making Strawberry Jam is not that difficult, and it’s a great way to preserve your summer harvest and enjoy it all winter long. 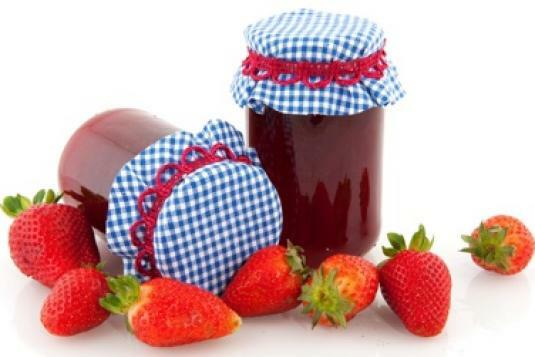 Below you will find detail information on how to make your own Strawberry Jam including; my favorite Strawberry Jam Recipes, some simple tips for making perfect jams, information about canning jam and the equipment required. Since it was first published in 1909 Ball’s Blue Book of Canning has been the standard reference guide for millions of home canners around the world. Now the folks at Ball have published Ball’s Complete Book of Home Preserving, which is sure to become the new go-to guide for home food preservation. This book features 400 modern recipes covering the canning of everything from Strawberry Jam to Tomatillo Salsa, all adhering to the latest food safety standards. Whether you are a canning novice, or a long time canner you are sure to find this book an indispensable addition to your reference library. Strawberries have a bad reputation with many in a jam making community, due to their unwillingness at times to set into a proper jam. Don’t let these rumors discourage you from trying your hand at making Strawberry Jam. 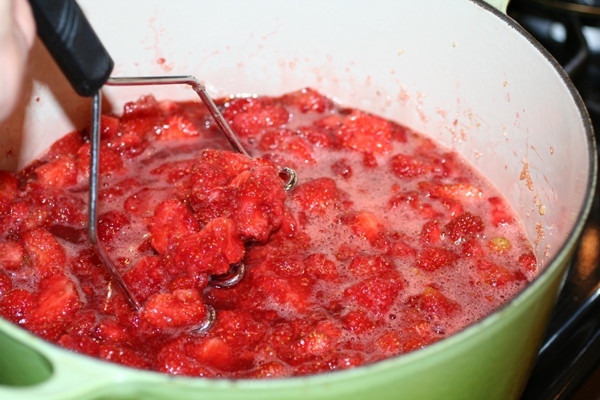 The Strawberry’s lack of Pectin is one of many factors that causes problems with the jam setting. The amount of pectin in a Strawberry is controlled by Mother Nature and is thus beyond our control. So let’s take a look at those factors which are within our control and how they can help us in our quest for the perfect Strawberry Jam. The Recipe is key in making the perfect Strawberry Jam. Find a proven recipe like the one below and follow it carefully, as if it were a map to some buried treasure. If you do this 99 percent of the time, you will end up with a perfectly set Strawberry Jam. The rest of the time you will wind up with a delicious Strawberry topping to serve over ice cream. That is a win-win in my book. The Fruit is also key in making the perfect Strawberry Jam. 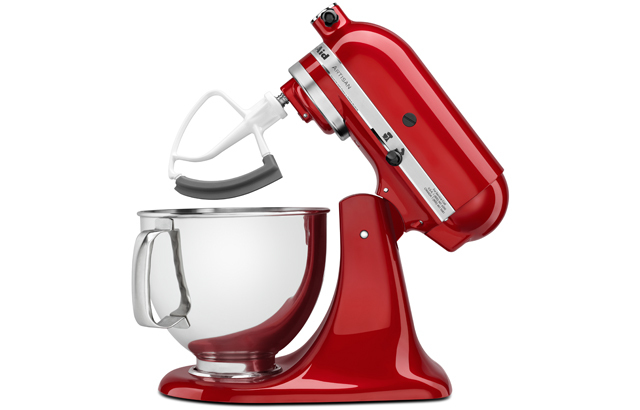 Use only firm ripe strawberries. Berries that are soft and over ripe have less pectin than firmer berries, and the pectin is critical if you want your jam to set up. The Pectin is another key in making the perfect Strawberry Jam. Powdered pectin and liquid pectin are not interchangeable. Dry Pectin is added before boiling and liquid pectin after. Use whichever type of pectin your recipe calls for, it will save a lot of heartaches. Small Batches are yet another key in making the perfect Strawberry Jam. Never try to double a recipe, as this can cause uneven heating resulting in Jam that is either over cooked or under cooked. Either one of these conditions can cause your Jam not to set. If you have more Strawberries than can be processed in one batch, repeat the recipe one batch at a time. Processing is also key in making the perfect Strawberry Jam. Always follow the processing instructions as carefully as the rest of the recipe. Under processing can cause your jars to seal poorly, which can result in moldy unusable Jam. Over processing can cook the flavor out of your Jam and cause problems with the setting. Strawberry Is The Favorite Flavor Of Jam In The U.S. The 9 flavors of Jam listed in order of popularity below, account for 80% of all Fruit Jam sales in the U.S. each year. In the U.S. Strawberry is far and away the favorite flavor of Jam. So, are you a member of the majority, or do you prefer something else? This is your chance to be heard, leave a comment below if your favorite Jam is not on the list. Pectin Is A tNatural Thickening Agent Pectin is a soluble gelatinous polysaccharide, that is naturally occurring in most fruit. More simply Pectin is a natural gelling agent in fruit, that when combined with the proper combination of heat, sugar, and acid makes your jam set. Hard fruits like apples, guavas, quince, plums, gooseberries, and oranges contain higher amounts of pectin and can be made into Jam without adding additional pectin. Soft fruits like strawberries, blackberries, cherries, grapes, apricots, and peaches are lower in pectin. When making Jam & Jellies with these fruits additional pectin, acid, or both will generally need to be added in order to get a good set. Prepare your water bath canner. Heat jars and lids in simmering water, don’t boil the lids! In a 6-8 quart saucepan, combine strawberries and lemon juice stir in pectin. Stirring constantly, bring mixture to a full rolling boil over high heat. Add sugar stirring to dissolve. Return jam mixture to a rolling boil. Boil hard for 1 minute, while continuing to stir constantly. Remove from heat and skim foam with a large metal spoon. Transfer hot jam into hot jars using a ladle; leave a ¼” of head space at the top of each jar. Center lid on the top of jar and screw ring on jar finger tight. Remove jars of jam from boiler and cool. 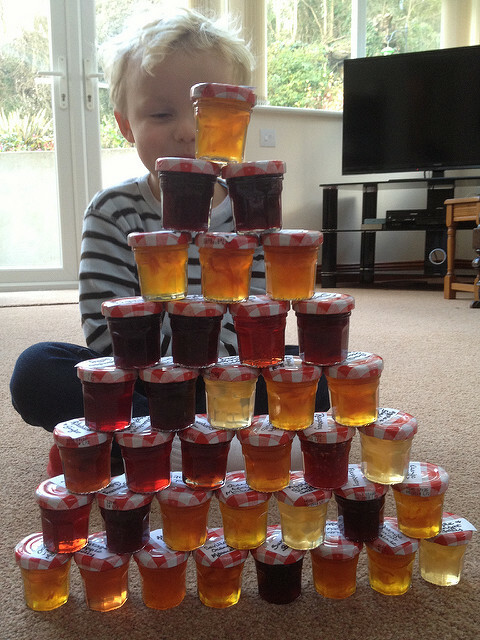 If all goes well as the jars of jam cool, you should hear an audible pop when the lids seal. This Jam is absolutely delicious. This recipe has a lower ratio of sugar to Strawberries and no processed pectin. The result is a Jam that’s not quite as sweet as some other recipes. 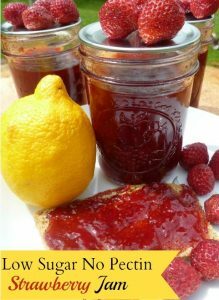 If you’re looking for a low sugar, no pectin Strawberry Jam recipe try this one. 8 Cups Strawberries hulled and halved. Place a small saucer in the freezer. This will be used later, to test whether or not your Jam has reached the gel stage. Chop the unpeeled lemon finely. Place apples and lemon in a saucepan, with enough water to prevent scorching. Boil apple citrus mixture until soft, approximately 20 minutes. Once the mixture has softened, force it through a strainer with the back of a spoon. This should yield about 2 cups of puree. In a deep pot combine, the apple citrus puree, strawberries, and sugar. Bring to a boil over medium heat, stirring frequently. Boil Jam for 20 minutes, until it thickens then remove from heat. return the pot to the heat and continue boiling. Test at regular intervals. Ladle hot Jam into jars, leaving about 1/4″ headspace. Wipe jar rims with a clean rag, center lids on the jar, install rings finger tight (no need to reef them down). Remove jars from canner and let cool to room temperature. 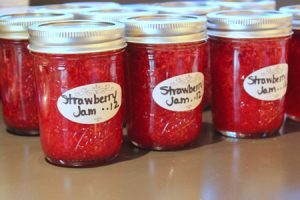 If you’re not sure about Canning Strawberry Jam, you may like to try this simple Strawberry Freezer Jam. No fancy canning equipment required. Rinse 5 one-cup freezer containers and lids in boiling water. Dry completely and have them standing at the ready. Remove Strawberry hulls and crush thoroughly. Measure exactly 2 cups of crushed Strawberries into a large bowl. Stir sugar into crushed berries and let stand 10 mins, stirring occasionally. After 1 minute of boiling, pour the pectin mixture over the Strawberries. Stir the berry-pectin mixture for 3 Minutes, or until the sugar is dissolved. Ladle Jam into containers immediately, leaving about a 1/2 in. Of head space. Wipe the edges of the containers clean and put on the lids. Let the Jam stand at room temperature for 24 hrs. That’s it. After 24 hrs, your Jam can be stored in the refrigerator for up to 3 weeks or in the freezer for a year.